The 3 in 3 weekend. Something that is virtually unavoidable in the world of minor pro hockey. For the first time this season, the Devils had to deal with a 3 in 3, with a long trip north to Maine followed by the first two home games of the season. And after a slow start to the weekend, the team finished up strong, getting four out of a possible six points and moving up in the North Division. The weekend began with a trip north to Maine, as Albany made its only visit of the season to the Pirates. First period was all Devils, as Paul Thompson finally scored his first of the season midway through for a 1-0 advantage. Blake Pietila took advantage of a turnover late in the period, broke in all alone and scored his second in as many games for a 2 goal lead. But the momentum would switch over to the home team in the second, as the Pirates got on the board thanks to a loose puck in the crease. Then it became the Greg McKegg show (that really should be a show with that name)…first he ties the game up at 2 going top shelf on goaltender Doug Carr, making his first appearance in net. Early in the third, McKegg pulls a near identical move to put Portland ahead. Finally, he sealed the hat trick with a power play empty netter with 46 seconds remaining for a two goal win for the Pirates. Outside of that, it was not a bad performance for Carr, as he stopped 23 of 26 shots. Vojtech Mozik earned his first North American point with a first period assist. For the first time all season, the Devils did not score a power play goal, going 0 for 5 with the man advantage. Power Play: 0 for 5. Penalty Kill: 4 for 5. Penalty Minutes: 10. Shots on Goal: 28. Shots Allowed: 27. Video via AHL Live can be found here. 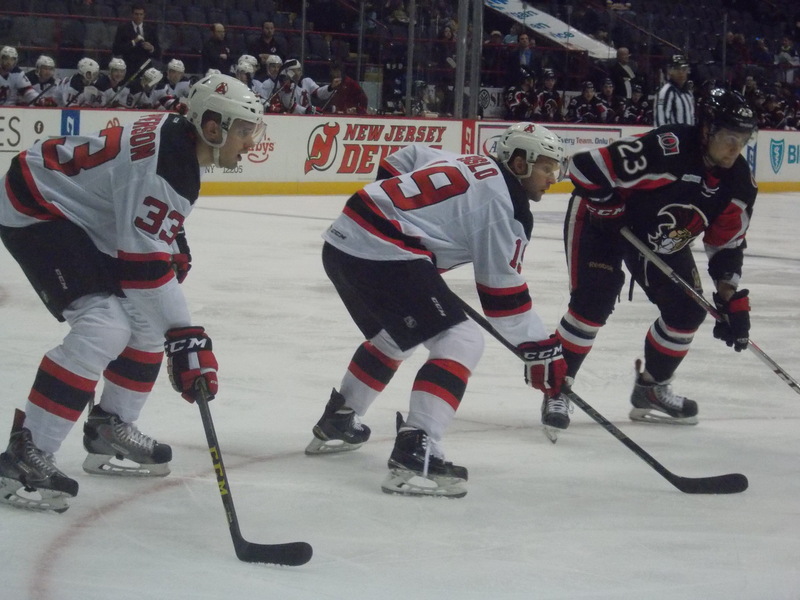 19 and a half hours and 268 miles later, the Devils and Pirates had their rematch, as Albany finally got to play on home ice for the first time this season. 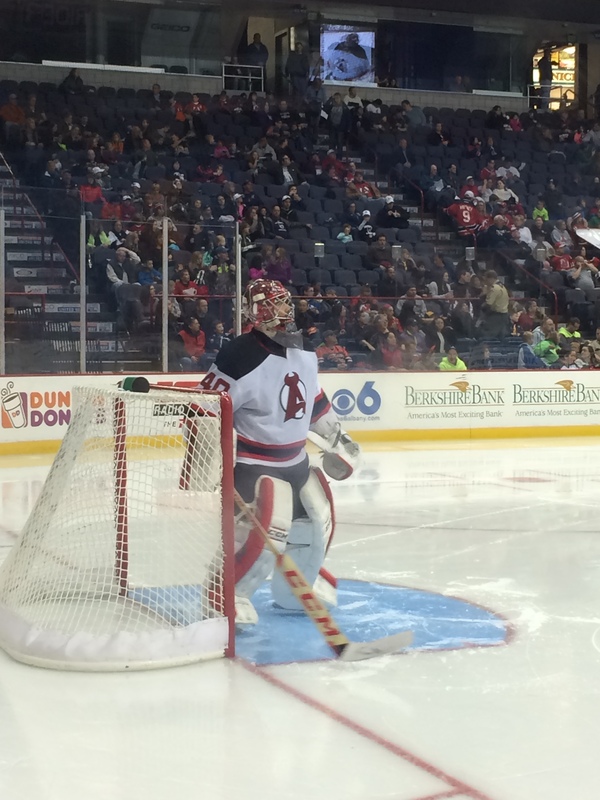 After a scoreless first period that saw Albany outshoot their guests 12-5, the Devils got things going in the second. Reid Boucher would score his first since returning to the roster midway through for a 1-0 lead. Blake Pietila would continue his scoring streak, scoring his third in as many games late in the period to double the lead. Albany would put the Pirates away for good in the third, as Jim O’Brien would score on the power play early for a 3-0 advantage. Yann Danis would lose his shutout bid with 2:16 to go on what was otherwise a nearly easy day in net for him, as he only had to face 21 Pirate shots, stopping 20. Five different Devils would add helpers. 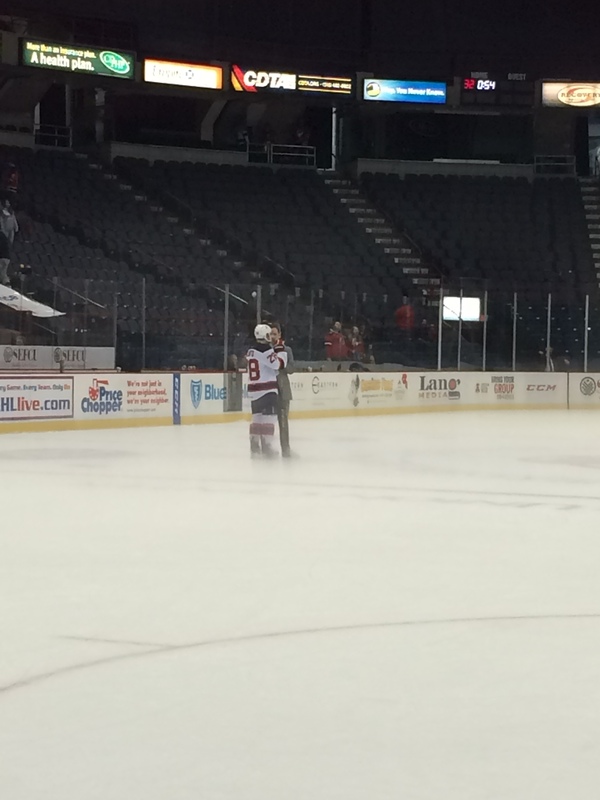 #1 star Reid Boucher being interviewed postgame…a new home tradition is born. 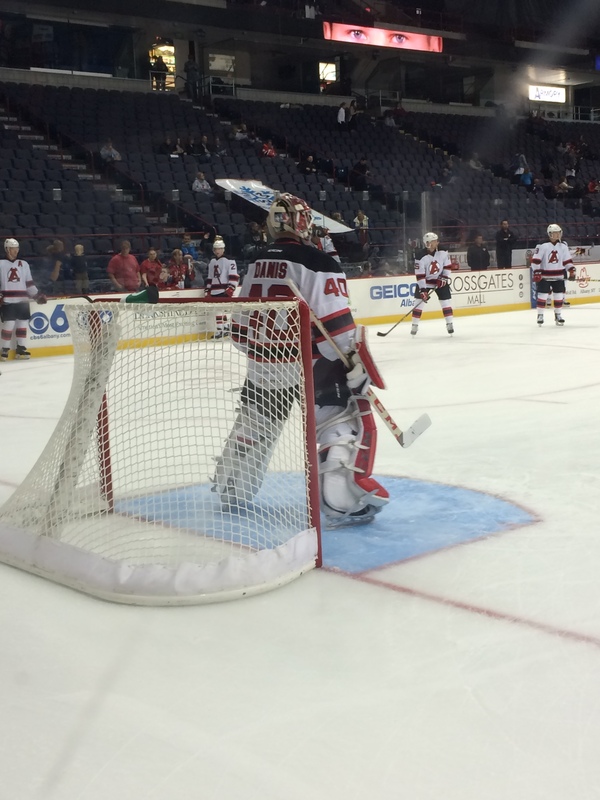 To finish off the weekend, the Devils welcomed the Senators in a rematch from Opening Night. After killing off an early 5 on 3 chance, the Devils had a golden opportunity to jump ahead with a 4 minute power play chance, but could not convert. But on a late period kill, Binghamton would get on the board first (and there was just :03 left on said kill too), taking a 1-0 lead after one. But then the Devils would take over, but not the way they wanted to. Paul Thompson would have to leave the game after getting boarded by Binghamton’s Zack Stortini, who was served a five minute major and a match penalty. Matt Lorito would tie the game up during the 5 minute man advantage. After a possible Mike Sislo goal was waved off (it hit the crossbar and just barely did not cross the line), Corey Tropp would score on a later power play to put Albany ahead for good…but they weren’t done just yet. After a delay of game call on Binghamton early in the third, Joe Blandisi would connect for his second goal for a 3-1 lead. 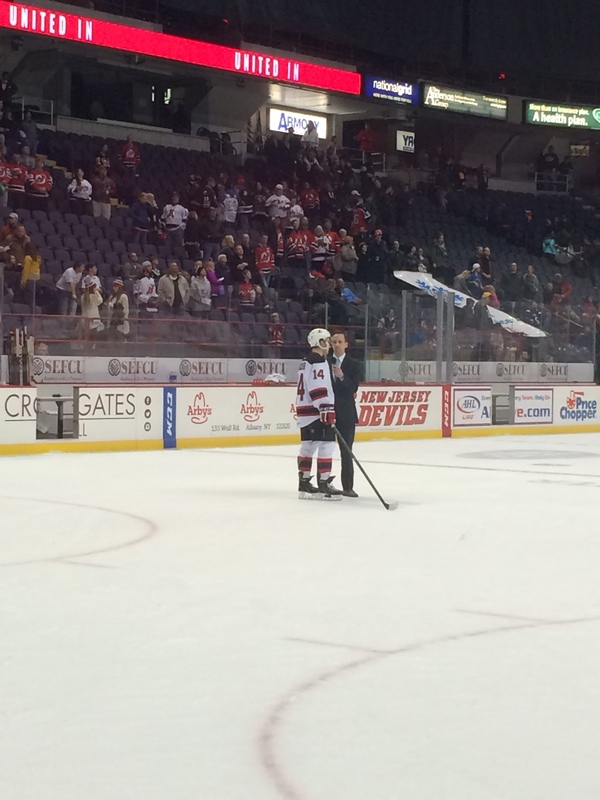 Reid Boucher would put the cherry on top with another power play goal for the Devils second straight win. Another good outing for Yann Danis in net, as he stopped 23 of 24 shots. Marc Andre Gragnani would contribute two assists, while six other Devils would get on the scoresheet (including Blake Pietila, who now has a 4 game point streak). Power Play: 4 for 10. Penalty Kill: 5 for 6. Penalty Minutes: 19. Shots on Goal: 38. Shots Allowed: 24. Quite a few players to choose from, but I’ll give it to the guy who wasn’t even on the roster at the beginning of the week, but came up big in back to back wins…Reid Boucher and his two goals. Honorary mention to Blake Pietila and his 3 point effort. 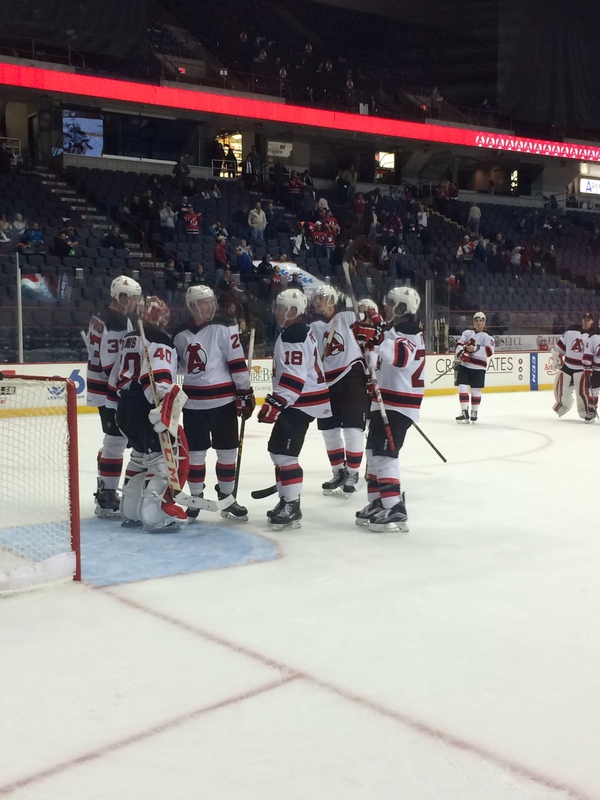 Just like the Devils, Adirondack had their own 3 in 3 weekend…and it was a clean sweep, defeating Brampton on the road and Manchester in a home and home series, improving their record to 4-0. Ken Appleby started the first two games of the weekend, stopping 18 of 22 shots on Friday against the Beast in an overtime win, then followed up with 37 saves on 39 shots on Saturday in a 4-2 win over the Monarchs. Joe Faust would score his first of the season on Sunday in a 5-2 win. Alexandre Carrier registered his first assist of the year in Sunday’s win as well. Up next for the Thunder: they host Orlando on Wednesday night before embarking on a 6 game road trip, starting Friday night in Wheeling. Bad news…it’s another 3 in 3 weekend. Good news…it’s all on home ice, as the Devils finish off their 5 game homestand. Friday night Bridgeport makes their first visit…oh, and it’ll mark the first time Joe Whitney will face his former teammates. 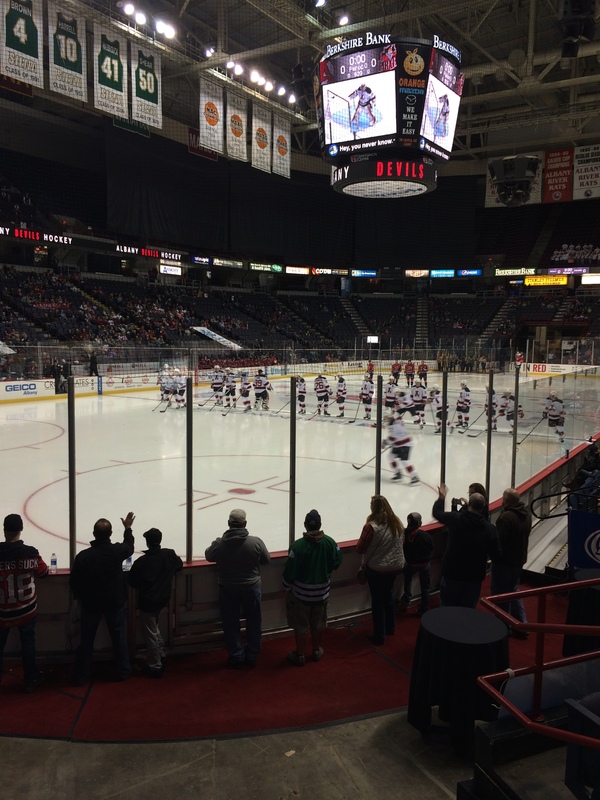 Halloween afternoon Utica makes their first visit as divisional foes. And as the calendar turns to November, Toronto will pay a visit on Sunday afternoon for the first time in several years.